Foolish Stephen Colbert. 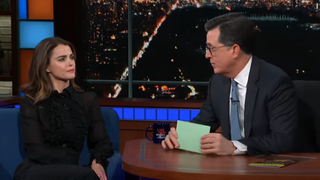 On Tuesday’s Late Show, the host thought that, just because she’s no longer portraying Russian super-spy Elizabeth Jennings since The Americans took its final bow last May, she’d be easy to break. Starring as she is (in some capacity) in J.J. Abrams’ upcoming ninth Star Wars episode (of some title), Russell sat in Colbert’s fiendish chit-chat chamber (the Ed Sullivan Theater) and weathered every line of questioning noted Star Wars geek Colbert employed. Trying one last, time-tested trap on the actress (who’s currently starring alongside Kylo Ren himself, Adam Driver, on Broadway), ordering his minions to push in for a tight closeup on Russell. Admonishing his guest that his cameras could pick up even the slightest change in demeanor or micro-expression, Colbert then peppered Russell with his list of deviously prepared questions as to just which character with a slightly awkward-sounding name she’ll been portraying. Yoda’s ex-wife? A Rebellion super-spy with a lot of wigs? Just a space-lady looking for her keys? If there’s any justice (space-justice), Colbert’s final, Chewbacca-adjacent guess will turn out to be on the money, but, as ever, Keri Russell doesn’t talk. Rian Johnson and Mark Hamill are back to shut down whiny "manbabies"